If you’re going to borrow elements from any puzzle game, there’s really no better choice than Portal. Valve’s acclaimed series provided a welcome blend of mind-bending challenges and colorful humor to a genre that sorely needed it. Don’t mistake Q.U.B.E: Director’s Cut for just another ripoff, though. While Toxic Games’ remastered offering is certainly inspired by the battle between Chell and GLaDOS, it’s more than just another weak imitation. Waking up in the aftermath of an unexplained incident, Q.U.B.E begins with you stationed in what appears to be a padded cell. Before you can fully get your bearings, though, you’re contacted by Nowak, a female captain stationed on an orbiting space shuttle. She explains that you are actually stranded on an alien ship, and are the only thing between it and Earth. However, Nowak can only communicate during the brief window when her ship passes by, so for the most part, you’re on your own. She isn’t the only one trying to reach you, though, as soon a secondary voice chimes in. Frantic and excited in tone, he claims that you’re not in space, but rather deep underground. A victim of a scientific experiment, that is. With the dueling voices ringing in your head, you will need to decide who is telling the truth, and just where you are. It may not have the humor of Portal, but Q.U.B.E has a surprisingly gripping narrative. Calling upon themes of isolation and identity, the Rob Yescombe (Alien: Isolation) penned script is focused on more existential and weighty issues than some would expect. Since you are a silent protagonist, most of the emotional heft of the storyline falls onto Nowak’s shoulders. She can more than handle the load, though, and her monologue about the burden of being alone orbiting the Earth is crushing to listen to. The excellent voice acting provided by Rachel Robinson and Rupert Evans also gives a real gravitas to the story. That said, with a campaign that only lasts a few hours, it definitely could have been fleshed out more in an attempt to reach the upper echelon of storytelling. Hypothetically speaking, if you were the only thing standing between Earth and utter annihilation via our Alien Overlords, you would probably want something with a little “oomph” to fight back with. A laser gun of some sort would be ideal, but really any firearm would suffice. Unfortunately, you have no sort of weapon to use. What you do have, though, works just as well. Outfitted in a sleek spacesuit, players can manipulate different boxes in order to make it out of each room. While you cannot control the standard white boxes of the ship, you can control just about any other colored block. Each colored box has a different power; blue blocks can launch you into the air, red blocks form a straight-forward tower, and so on. In spite of how boring this may sound, Toxic Games clearly knows how to craft a satisfying puzzle. The vast majority of the puzzles found in Q.U.B.E: Director’s Cut are not only rewarding to solve, but also fun to play around with. Things start out slow, but over time you’re allowed to approach each room in whatever way you choose. It also helps that there are no real fail states to be found in the game. If you find yourself stuck or trapped on a puzzle, most of the rooms allow you to reset in order to approach it from a different angle. 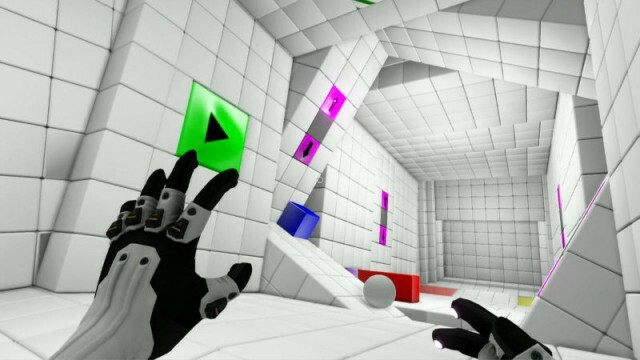 Unlike some puzzle games, Q.U.B.E has a refreshing difficulty curve, which is one of the major reasons why the puzzles of the title remain fresh throughout. 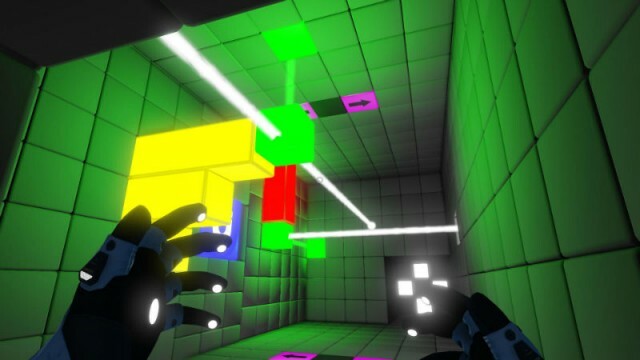 After the first handful of puzzles, which rely mostly on using the blocks to escape a room, Toxic Games begins to add in different mechanics to switch things up. One portion of the game may have you manipulating a ball so it reaches a color coordinated wall, while another has you bouncing a laser off mirrored panels. Each one builds off the knowledge and skills you developed over previous rooms, so it never feels like you’re being ambushed with a new stipulation. Once you finish off the all too brief campaign, the newly included Against the Clock mode will provide an even tougher challenge. A series of time trial courses, these fiendishly designed rooms can be an absolute nightmare to run through. Personally, despite my love of brain teasers, I didn’t find myself enjoying running through these time trials. I’m generally more of a fan of slow-paced challenges, so having to quickly speed through each room was not only a little too tough for me, but not entertaining enough, either. Still, for those that it appeals to, I imagine Against the Clock will be a blast to experience. The Portal influence can also be spotted in the aesthetics and world of Q.U.B.E. The monochromatic and sterile ship gives the whole game the feeling that you are in one big experiment, which works well with the storyline. The colored blocks contrast well with the blindingly white rooms, and they provide a welcome splash of energy in every room. While the graphics as a whole may not match up to most current-gen releases (this is a re-release of a 2011 game, after all), they fit the mood Toxic Games was trying to create. 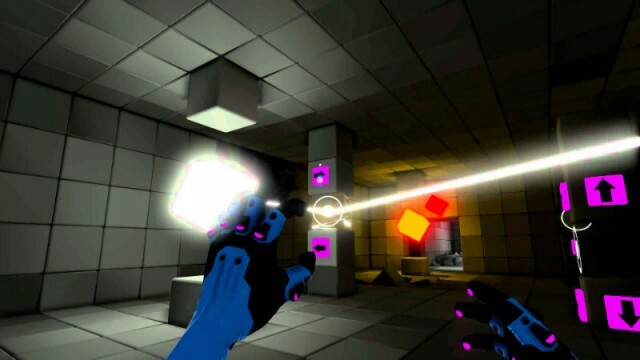 While it may not fully escape the shadow of Valve’s influential puzzler, Q.U.B.E: Director’s Cut is a more than a satisfying addition to the genre. Toxic Games was smart to include a brand new storyline with this re-release, as the tale pairs excellently with the crafty puzzles featured in the previous release. While it would have been nice if the campaign could have lasted a few more hours, puzzle fiends will find that there is more than enough content to justify a look.